That title looks like it’s in German. Or Dutch. I posted last week about how Josh unwittingly gained some internet infamy …interfamy when a picture of him dressed as Kratos from God of War was used in a humorous video game review video for Heavenly Sword. 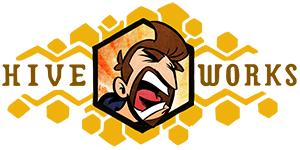 Worse yet, it was linked by Tycho on Penny Arcade’s site. Whether they realize it or not, the whole of the internet has seen Josh in red body paint wielding dual sickle-scythe’s. The Kratos Halloween costume he crafted was actually pretty impressive. I believe that was the first time he shaved his head, and he hasn’t looked back since. Subsequently, he hasn’t NOT looked like a sexual predator since. He also took down a cyclops in an epic boss-battle. Ok, he actually assaulted a homeless veteran with an eye patch but Eli and I cheered him on all the same. He was so enthusiastic! 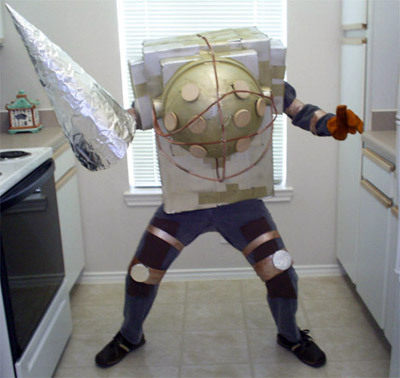 I have a feeling that the real version of the Big Daddy costume would involve more Scotch Tape and Reynold’s Wrap than welding torches and 75 year old underwater exploration equipment. Posted in Uncategorized and tagged bioshock, cosplay, gaming, god of war, video games. SELLING MISTAKE: back sense should be >> back since. OMG I took that picture of Josh!!! That’s the “patio” area of my apartment!!! Seriously..it was really cool in person…especially the real swords he had chained to his wrists. And yes, he totally looks like a predator.